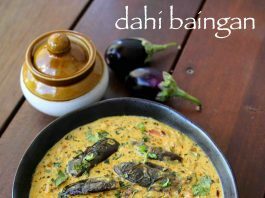 dahi baingan recipe | dahi baigana | brinjal curry in curd with detailed photo and video recipe. 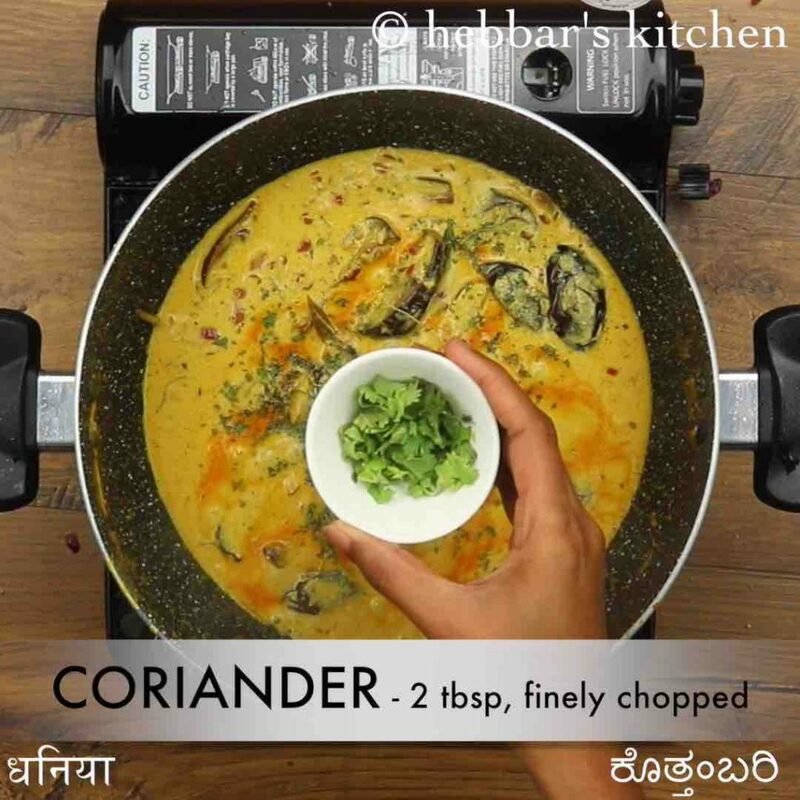 a unique way of preparing eggplant curry with deep fried brinjal and spiced and cooked yoghurt curry. it is a popular curry from the bengali and odia cuisine, but similar curry is prepared from the kashmiri cuisine too. it can be an ideal curry for lunch or dinner when served with roti / chapathi. 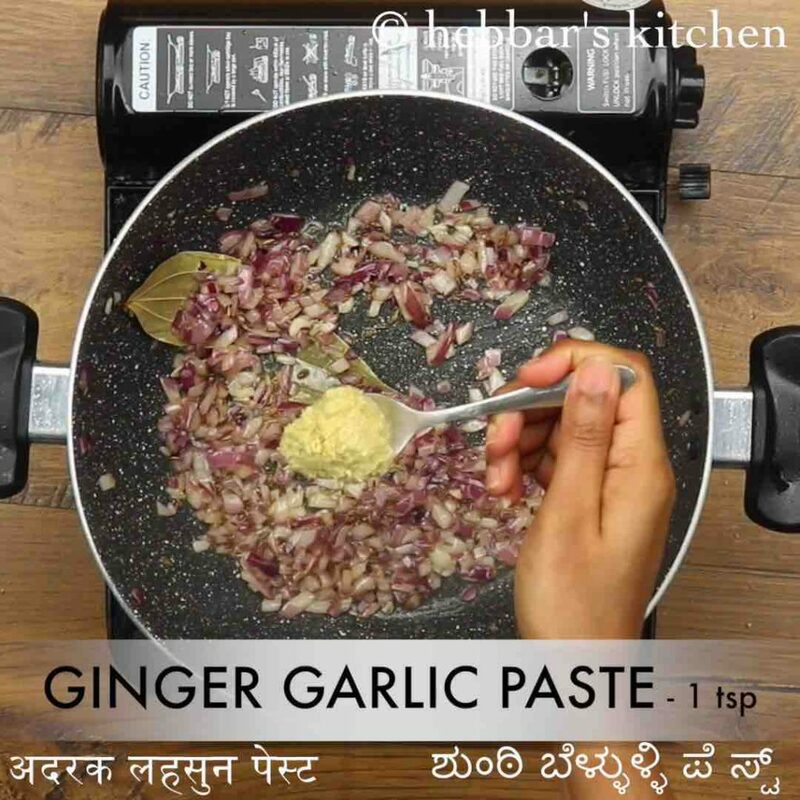 dahi baingan recipe | dahi baigana | brinjal curry in curd with step by step photo and video recipe. indian cuisine is so huge and has to offer so many varieties of its curries, sweets and breakfast dishes. dahi baingan recipe is one such variation from the odia or bengali cuisine prepared with curd as its base for the curry. the recipe is cooked within minutes without much spices involved and hence can be cooked by amateur cooks too. initially, the recipe can look cumbersome and perhaps be overwhelming to beginners because of the name and also with the texture. but trust me it is one of the simple brinjal curries with gravy to be prepared. 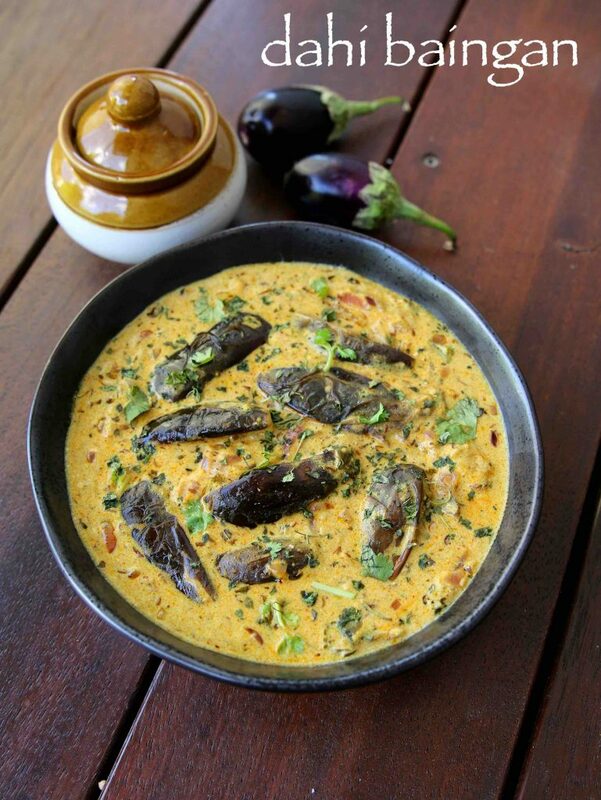 comparatively, most of the eggplant curries are prepared by stuffing it with either grounded coconut or peanut-based masala which can make it complex to prepare. however, dahi baingan recipe is very simple with no tomato based sauce and no stuffing. 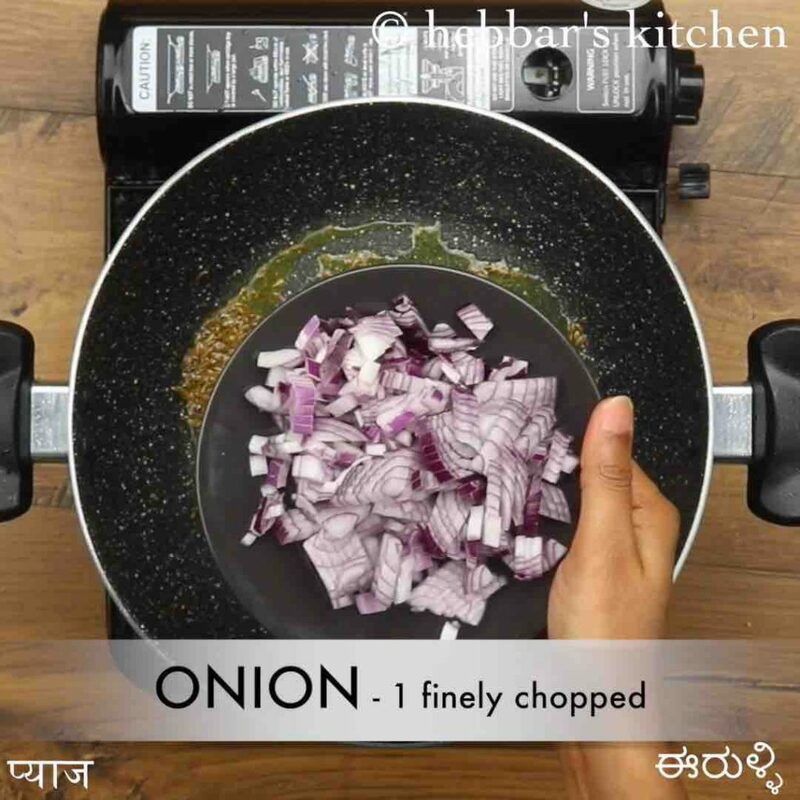 sliced baingan’s are deep fried or pan fried which is later added to spiced yoghurt curry. 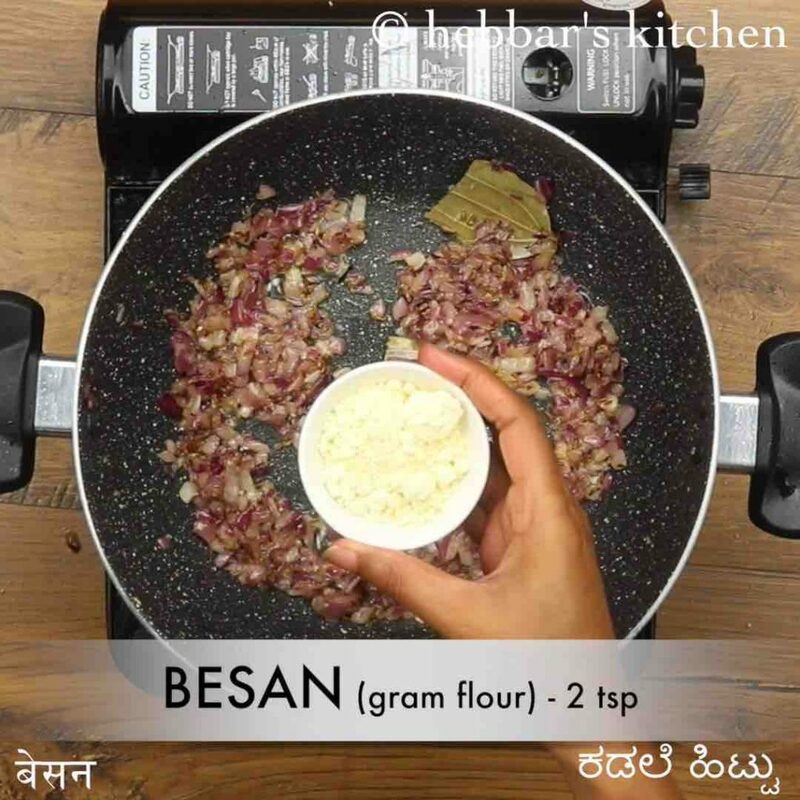 further, there is no rocket science to prepare the curd based curry as it is prepared with minimal spices and besan / chickpea flour for the proper thickness. while the recipe is extremely simple, some tips, recommendations and serving ideas for dahi baingan recipe. firstly, as i mentioned it previously the sliced eggplants can be either deep fried or pan-fried. i personally like the pan fried with brinjal cooking with less oil and hence i have followed the same. secondly, do not forget to whisk the curd properly before using it for cooking. moreover cook the yoghurt based curry in low to medium heat, otherwise, it may curdle with high heat. lastly, the thin yogurt based brinjal curry tastes ideal with phulka, paratha and roti. but also tastes great when served with vegetable pulao or peanut rice too. firstly, in a large kadai heat 3 tsp oil and roast 6 sliced baingan and keep aside. now to the same kadai, heat 2 tsp oil and add 1 tsp cumin, 1 bay leaf and pinch of hing. saute well. now add 1 onion and 1 tsp ginger garlic paste and saute well. further add 2 tsp besan and roast on low flame for 5 minutes. 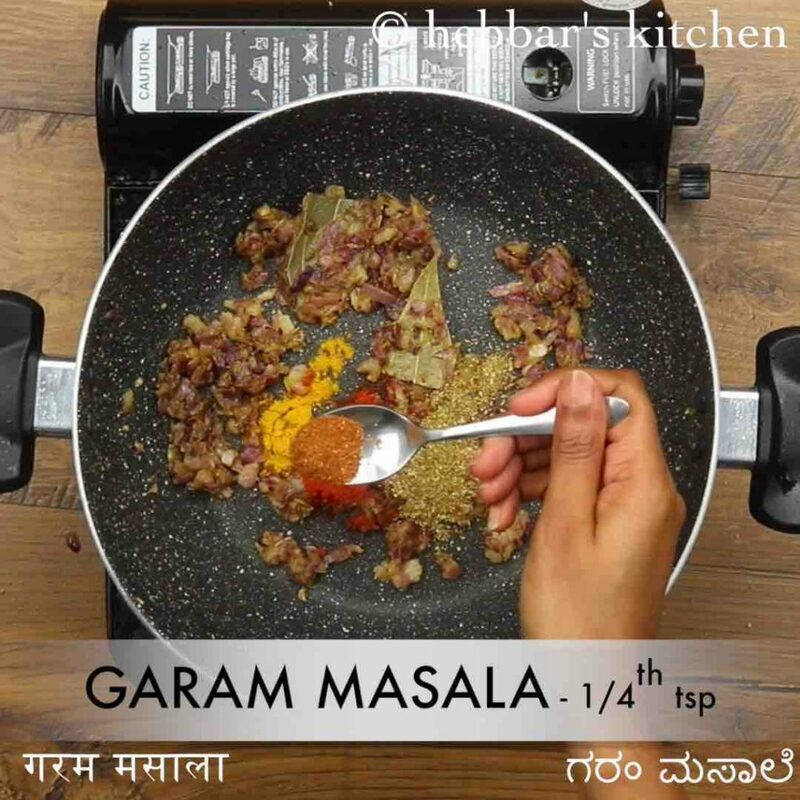 additionally add ¼ tsp turmeric, ½ tsp chilli powder, ½ tsp coriander powder and ¼ tsp garam masala. now add ½ cup water and 1 cup whisked curd keeping the flame on low. 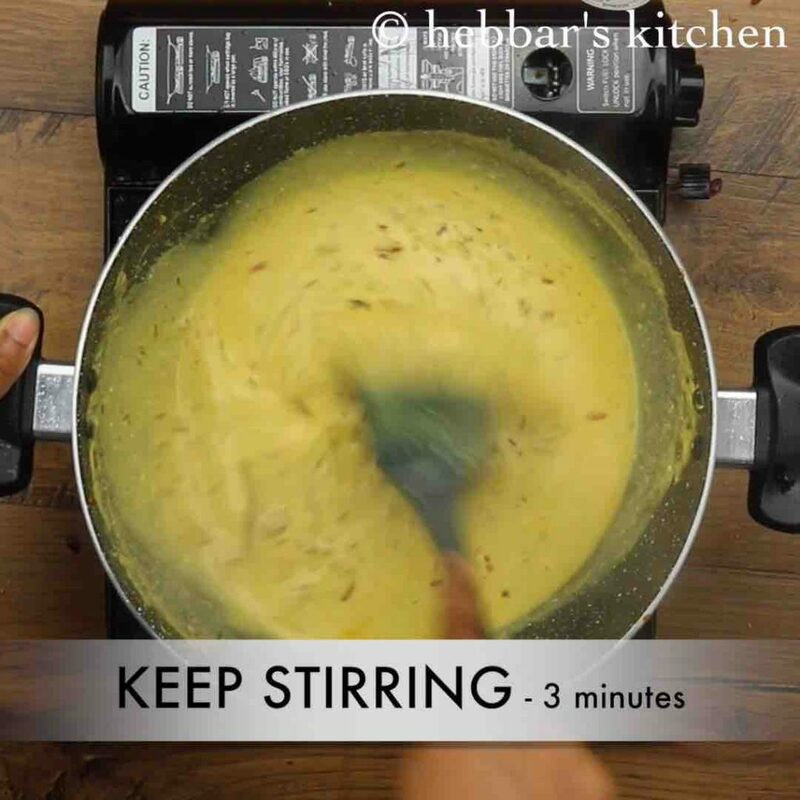 stir continuously till the curd combines well. 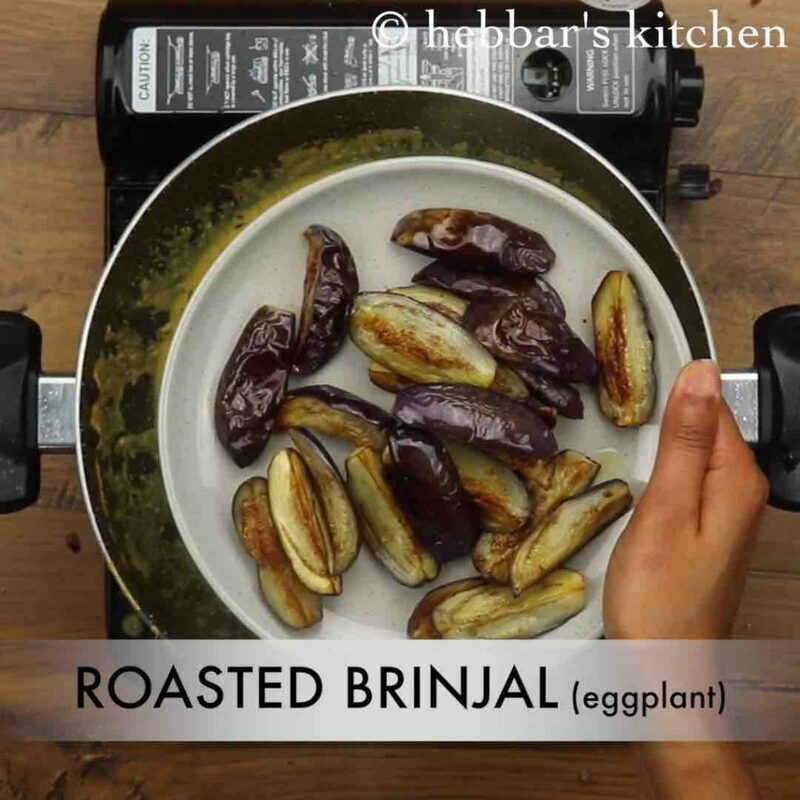 add roasted brinjal and ½ tsp salt. 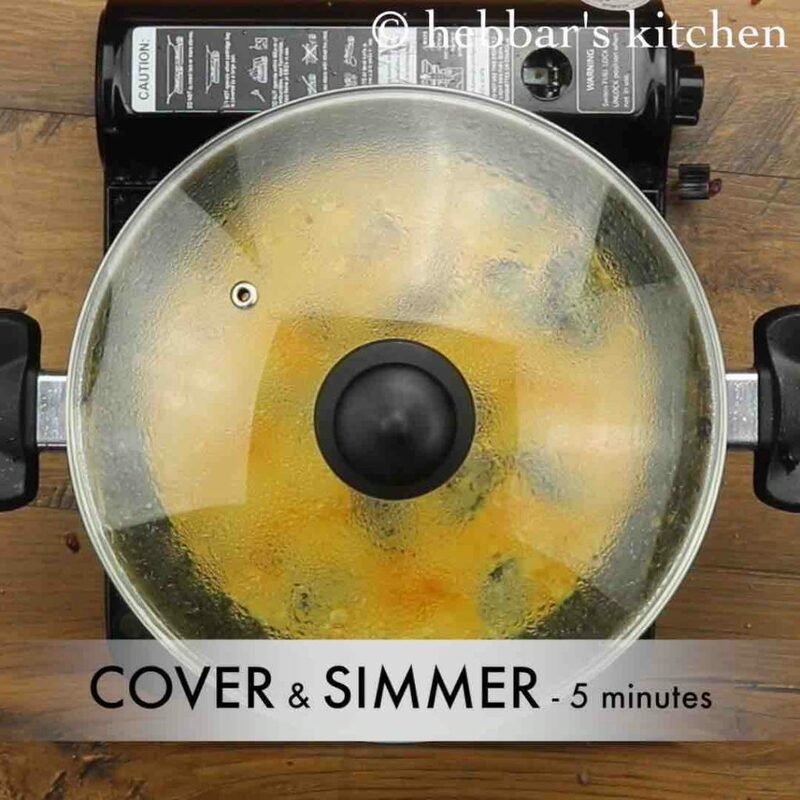 mix well, cover and simmer for 5 minutes. 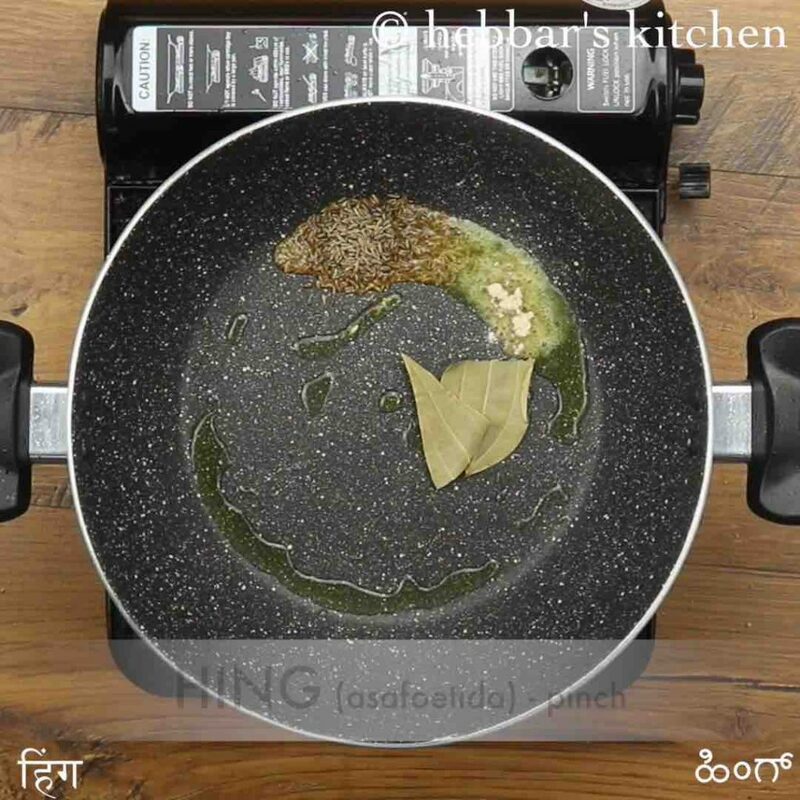 further add 1 tsp crushed kasuri methi and 2 tbsp coriander leaves. mix well. finally, serve dahi baingain with chapathi or kulcha. firstly, in a large kadai heat 3 tsp oil and roast 6 sliced baingan. 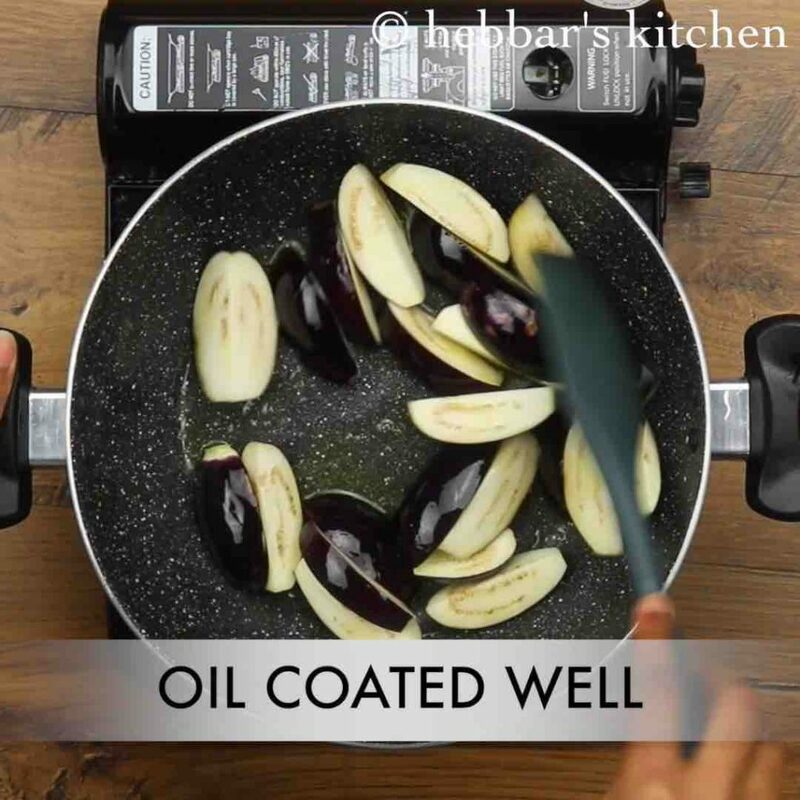 mix gently and coat the brinjal with oil, for uniform cooking. 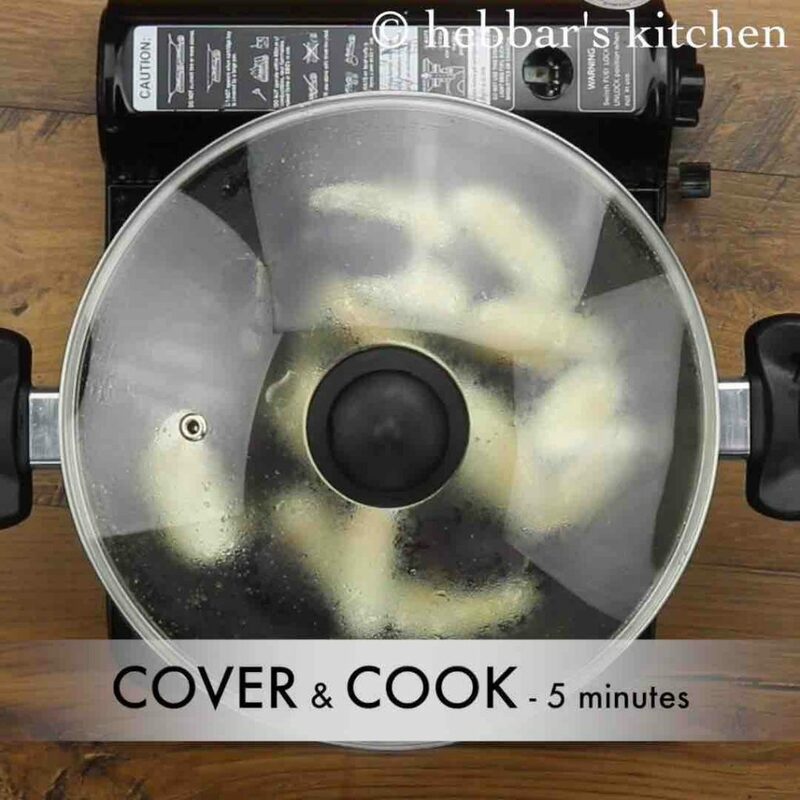 now cover and cook for 5 minutes. stir occasionally to prevent from burning. 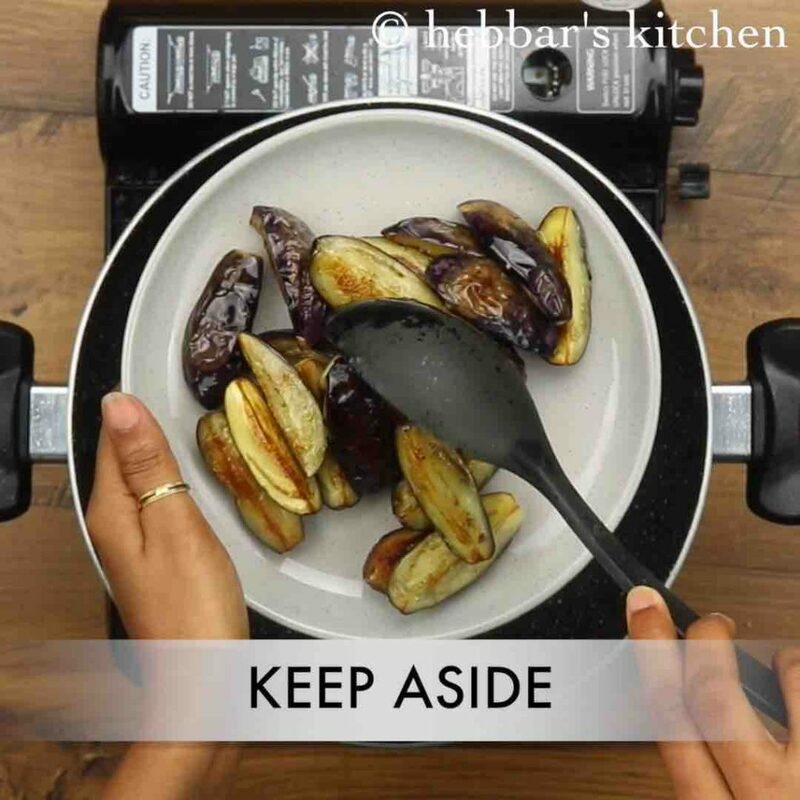 cook till the brinjal turns golden brown and cooked from all the sides. keep aside. now to the same kadai, heat 2 tsp oil and add 1 tsp cumin, 1 bay leaf and pinch of hing. saute till the spices turn aromatic. now add 1 onion and saute well. also add 1 tsp ginger garlic paste and saute till the raw smell disappears. further add 2 tsp besan and roast on low flame for 5 minutes or till the raw smell disappears. 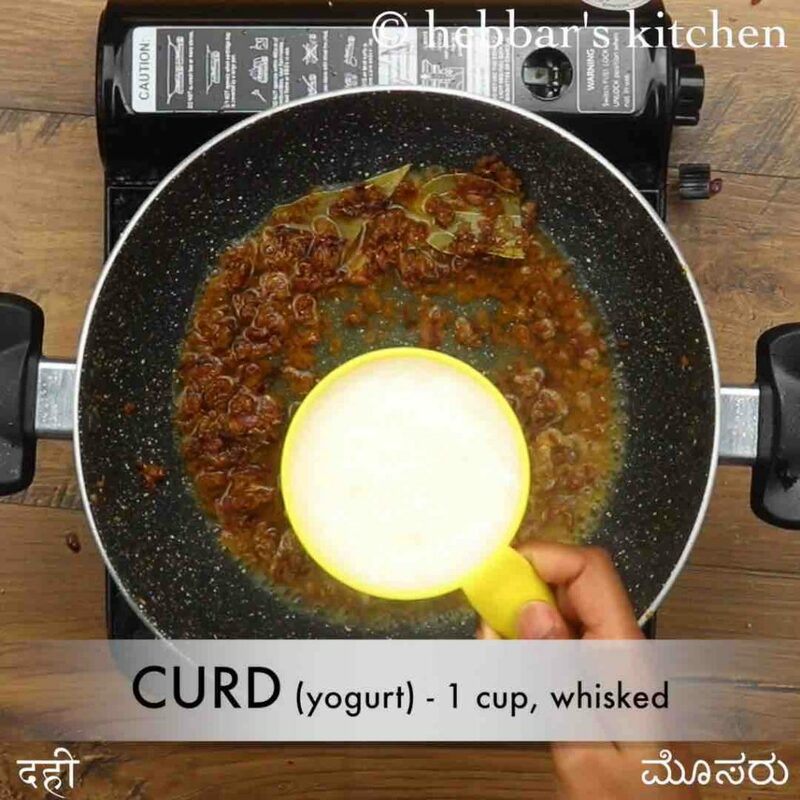 stir continuously till the curd combines well and does not curdle. 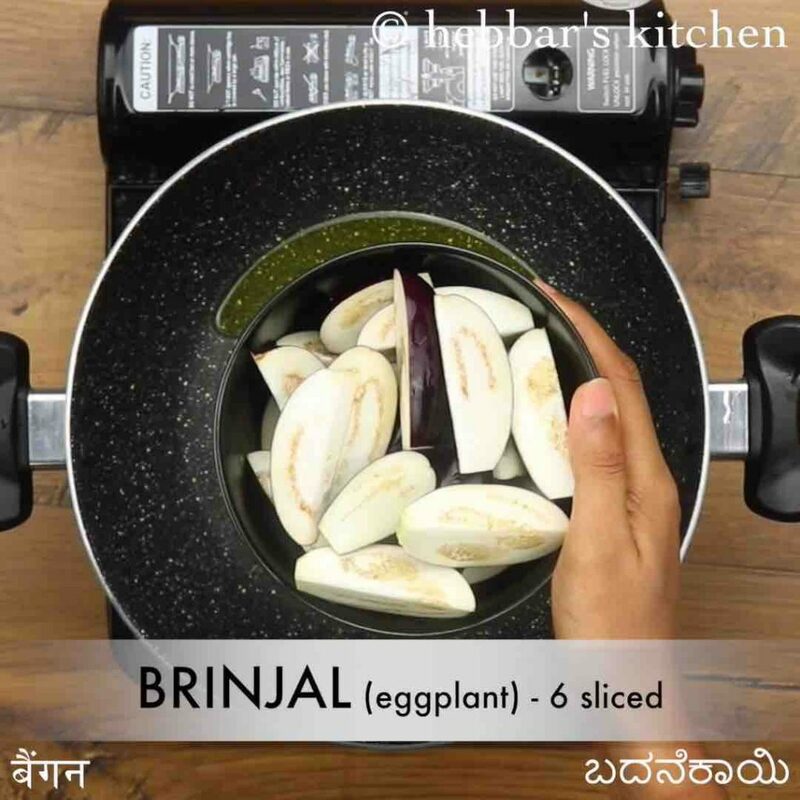 once the curd comes to a boil, add roasted brinjal and ½ tsp salt. 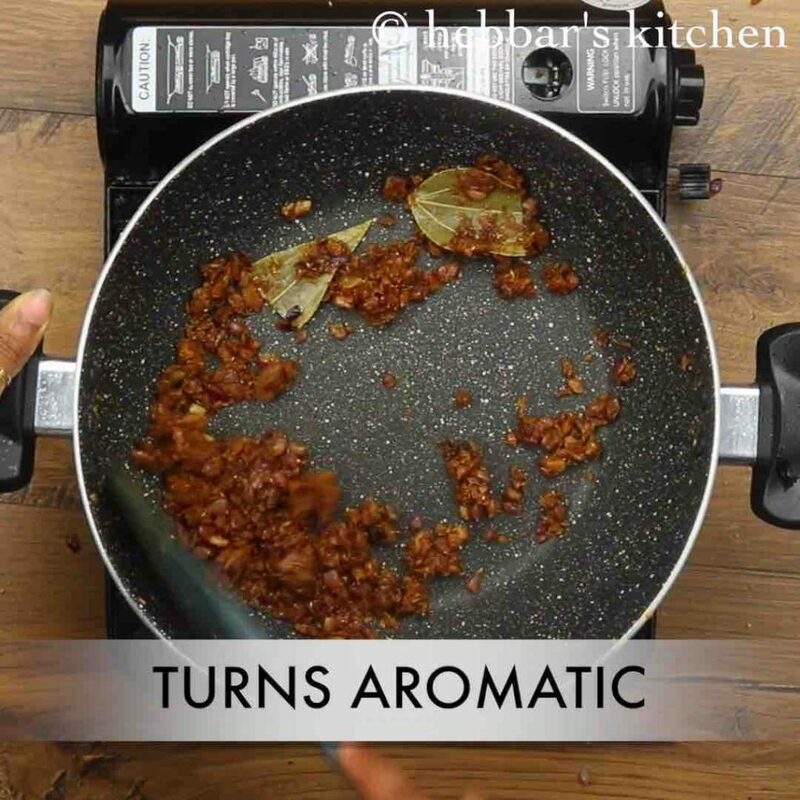 mix well, cover and simmer for 5 minutes or till baingan absorbes masala. firstly, roast the baingain on low to medium flame for uniform cooking. also, use whisked curd to prevent curd from curdling. additionally, add salt only after curd mixture comes to a boil. else there are chances for curd to curdle. 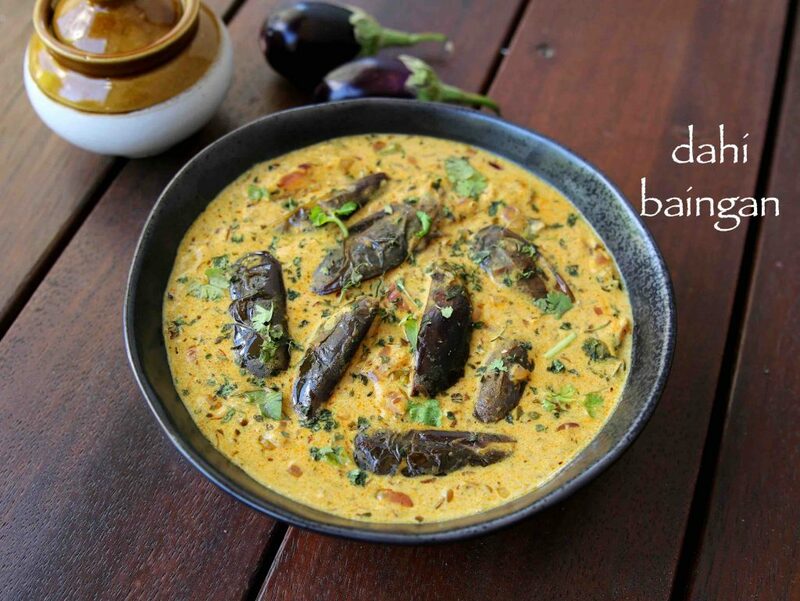 finally, dahi baingain recipe taste great when prepared with well roasted tender brinjal.